Color us proud! 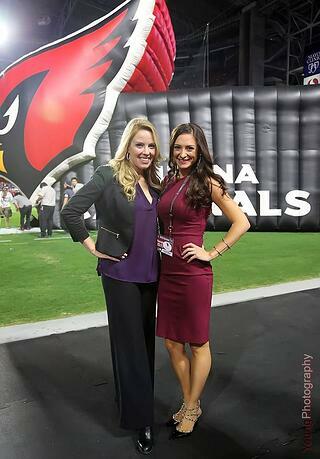 This last August, one of our very own local talents, Kristina Ferdig (a former Viking cheerleader and Line Up model) landed a new role as Director of Cheerleading for the Arizona Cardinals. Without skipping a beat, Kristina tackled her first task: Designing and ordering the team’s new uniforms. This was not a simple assignment. For one, these new uniforms had to be high-quality and long-lasting, as well as stay consistent with the previous look. However, Kristina also wanted a fresh, new, feminine style. The right fit was even more important. Kristina needed her girls to feel comfortable and confident. But the clock was ticking. With less than 2 months' turnaround time, the deadline was tight! Kristina turned to The Line Up and we sprang to action! We worked with the manufacturer that made the Cardinals’ NFL uniform to get the right fabric and color – making sure we met all of the NFL branding requirements. Of course, communication was essential throughout this process. As a NFL cheerleading team, many pens had to sign-off on the new uniforms. But that didn’t slow us down. The Line Up team partnered closely with Kristina, so nothing was left to chance. Some of the unique features of these costumes included the NFL branding, a detailed logo embroidered on the waistbands and plenty of rhinestones so Kristina’s girls would shine brightly in stadiums. Despite the many moving parts, we delivered the newly-styled, comfortable-fitting uniforms on time and ready to wear. All dolled up in their new uniforms, Cardinals’ Cheerleaders can confidently showcase their amazing talent and abilities and, of course, cheer on those Cardinals! Check out a few pics of Kristina during her Vikings and Line Up modeling days! Feminine, girly styles were always her favorite!